Survival of the fittest, or should that be nerdiest? 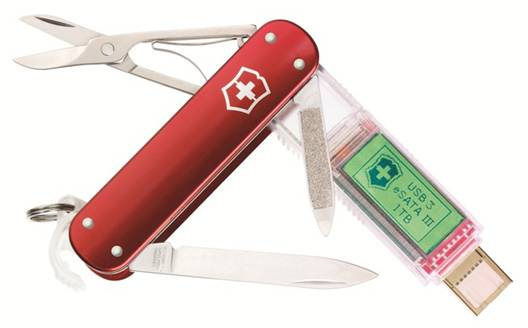 Victorinox has unveiled a Solid State Drive and USB add-on for everyone’s favourite survival tool, the Swiss Army knife. The stick style devices, which are USB 3.0 ready, simply clip into the housing, between the usual knife, scissor and nail file combination. They are available in memory sizes ranging from 15GB to 1TB. In theory, this is quite a clever idea but just ask yourself this. When you’re next out walking or camping, cutting down twigs, rabbit watching, identifying nettles and doing all sorts of other outdoorsy things, just how useful will a USB/SSD stick be? Even the graphic display can’t help you when it comes to building a raft to cross a stream. Can it?